Increasingly, treatment for a host of conditions and ailments is based on electroceuticals rather than pharmaceuticals. Instead of prescriptions for chemical molecules, some doctors are prescribing specific frequencies, waveforms, and amplitudes for their patients. This is not science fiction—it’s happening right now. It’s not really a stretch to see how this can be. Every day, car engines are started and doors are opened from a distance using a fob. This is made possible by matching frequency signals (waves) that are programmed to initiate a ligand–receptor type of reaction, allowing people to enter a warm space and be on their way. Photos and messages are relayed daily by the millions from one phone to another. Images and videos (waves, frequencies) travel through space, not getting crossed with others and reaching their intended destinations intact. MET and CES work because the nervous system and tissues function electrochemically and can be modulated readily by electrical intervention. Low-frequency current effectively targets cell receptors, activating them through frequency matching in a manner similar to that of chemical ligands. Taking the research findings of these and other pioneers, neurobiologist Daniel L. Kirsch, PhD, DAAPM, FAIS—whose mentor was Dr. Becker—patented a unique waveform. He collaborated with engineer Raymond Chan to design medical devices for implementing pain and stress control technologies into clinical systems. His Alpha-Stim technology was the first dual electromedical device (MET and CES) to be cleared by the Food and Drug Administration to market in 1981. Dr. Kirsch remains at the forefront of research in this field.2 Today, the Alpha-Stim and Fisher Wallace Stimulator (formerly Liss Cranial Stimulator) are the primary electroceutical devices on the market. 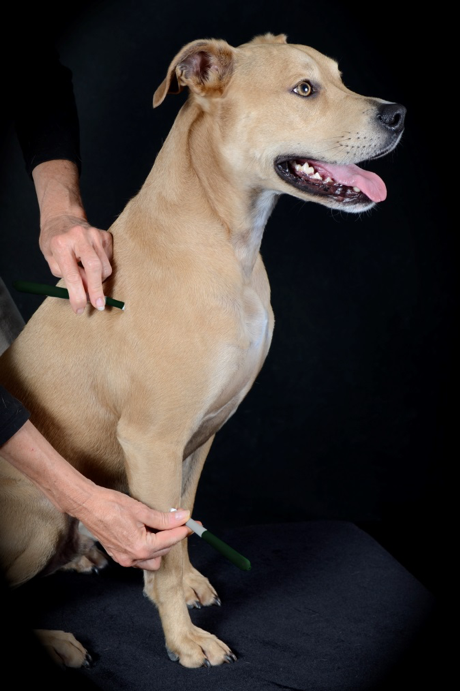 Microcurrent electrical therapy on the elbow of a dog with degenerative joint disease. As for many drugs, early research on MET and CES was conducted using animals. Once safety was established, the focus turned to human studies and clinical trials. Because the current is subsensory, it lends itself well to double-blind placebo-controlled crossover studies. Cells throughout the body manufacture peptides that act as ligands to surface receptors on other remote cells, communicating via the extracellular fluid and circulatory system. Cells within a specific organ or tissue system communicate through specific frequencies in the microamperage range, activating the current of injury and causing the system to tend toward homeostasis. Neuromodulation imparts an electric signal with a frequency that perfectly matches the receptors in the body to resonate and activate intracellular responses. MET can act similarly to ligands in activating receptors to send their messages into cells and produce effects resembling a wide range of chemical messengers. MET can be viewed as a catalyst in initiating and sustaining the numerous chemical and electrical reactions that occur in the healing process. An effective biphasic, squared, long-pulse-width waveform in the microamperage range (1000 times less than that of a transcutaneous electrical nerve stimulation device and below sensation threshold) will use resonant frequencies to activate central pain modulatory mechanisms. The sensation of pain is transmitted through the body along billions of nerve cells that are designed specifically to transmit messages through electrochemical signals. Physics controls chemical reactions in the body, and most bodily functions can be normalized electrically. It is the application protocol that affects the peripheral pain site directly and accesses the central nervous system by directing the current through the spine. Combining MET and CES addresses all 4 pain pathways: transduction, transmission, modulation, and perception. The resultant central and peripheral effects of CES include calmness, relaxation, reduced agitation and aggression, stabilized mood, improved sleep, and reduced pain. Results will vary with the exact technology used, the pathology of the disease being treated, the overall health and hydration of the patient, and owner compliance. Patient history, prior medical interventions, previous injuries, and surgical scars can affect overall outcome as well. Waveforms can be used effectively to activate the body’s natural electric impulses. CES and MET have been used extensively in the clinical setting for nearly 2 decades to initiate cellular regeneration and control not only acute and chronic pain situations, such as arthritis, spinal injury, nerve conduction deficiencies, cancer, sprains, strains, wounds, and surgical pain, but also such stress-related conditions as anxiety, insomnia, cognitive dysfunction states, noise phobia, and depression. Prescription MET and CES devices are long lasting, cumulative, safe, effective, easy to use, portable, and nonaddictive, and have no known tolerance concerns. Adverse effects are minor and self-limiting, primarily consisting of skin irritation. Treatments can be applied in clinic by the technical team, and devices can be prescribed for use at home with a short in-clinic training session. Initially, the best results will be achieved when treatments are applied twice a day, but in-clinic treatments administered 2 to 3 times per week will also be beneficial. Follow-up patient assessment includes clinical observation, range of motion, change in posture, use of extremities, calmness, improved sleep, appetite, attitude, and behavior. As an aid to endogenous bioelectric currents, electroceuticals can accomplish miraculous things. They may in fact work better in the absence of any interference from factors based on our previous, limited, chemical-dominant view of physiology. Today and in the future, disorders of both the body and mind might be better treated using a range of frequencies that have the potential to treat a variety of pathologies effectively without the risk of harmful adverse effects. 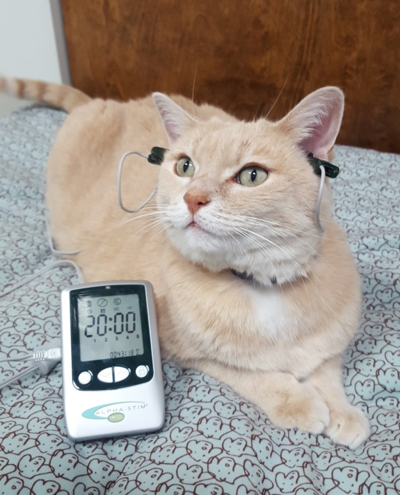 Dr. Frick is a leading authority in the application of microcurrent therapy for animals. Her focus on physiotherapy has spanned over 20 years and her research has been published in the Journal of Equine Veterinary Science, Innovative Veterinary Care Journal, and the Journal of the American Holistic Veterinary Medical Association. Frick A, McCauley D. Microcurrent electrical therapy. J Equine Vet Sci. 2005:418-422. Kirsch DL, Marksberry JA. The evolution of cranial electrotherapy stimulation for anxiety, insomnia, depression, and pain and its potential for other indications. In: Rosch P, ed. Bioelectromagnetic and Subtle Energy Medicine. 2nd ed. Boca Raton, FL: CRC Press; 2015: 189-211. Tan G, Rintala D, Jensen M, et al. Efficacy of cranial electrotherapy stimulation for neuropathic pain following spinal cord injury: a multi-site randomized controlled trial with a secondary 6-month open-label phase. J Spinal Cord Med. 2011;34(3):285-296. Taylor AG, Anderson JG, Riedel SL, et al. Cranial electrical stimulation improves symptoms and functional status in individuals with fibromyalgia. Pain Manag Nurs. 2013;14(4):327-335. doi: 10.1016/j.pmn.2011.07.002. Winick, Reid L. Cranial electrotherapy stimulation (CES): a safe and effective low cost means of anxiety control in a dental practice. Gen Dent. 1999;47(1):50-55. Barclay TH, Barclay RD. A clinical trial of cranial electrotherapy stimulation for anxiety and comorbid depression. J Affect Dis. 2014;164:171-177. doi: 10.1016/j.jad.2014.04.02. Becker RO. The Body Electric: Electromagnetism and the Foundation of Life. New York, NY: William Morrow and Company; 1985. Pert CB. Molecules of Emotion: The Science Behind Mind-body Medicine. New York, NY: Simon & Schuster; 1999. Nordenstrom BEW. Exploring BCEC-Systems (Biologically Closed Electric Circuits). Stockholm: Nordic Medical Publications; 1998. Jarzembski WB, Larson SJ, Sances Jr A. Evaluation of specific cerebral impedance and cerebral current density. Ann NY Acad Sci. 1970;170:476-490. Feusner JD, Madsen S, Moody TD, et al. Effects of cranial electrotherapy stimulation on resting state brain activity. Brain Behav.2012;2(3):211-220. doi: 10.1002/brb3.45. Krupisky EM, Katznelson YaS, Lebedev VP, et al. Transcranial electrostimulation (TES) of brain opioid structures (BOS): experimental treatment of alcohol withdrawal syndrome (AWS) and clinical application. Presented at: Society for Neuroscience Annual Meeting; November 10-15, 1991; New Orleans, LA. Shealy CN, Cady RK, Culver-Vehoff D, Cox R, Liss S. Cerebral spinal fluid and plasma neurochemical: response to cranial electrical stimulation. J Neurol Orthop Med Surg. 1998;18(2):94-97. Kolesos ON, Osionwo HO, Akkhigbe KO. The role of relaxation therapy and cranial electrotherapy stimulation in the management of dental anxiety in Nigeria. ISOR J Dent Med Sci. 2013;10(4): 51-57. Yennurajalingam S, Kang D-H, Hwu W-J, et al. Cranial electrotherapy stimulation for the management of depression, anxiety, sleep disturbance, and pain in patients with advanced cancer: a preliminary study. J Pain Symptom Manag. 2018;55(2):198-206. Hare JP, Misialek LH, Palis K, Wong C. Using cranial electrotherapy stimulation therapy to treat behavioral health symptoms in a combat operational setting. Mil Med. 2016; 181(11):1410-1412.